Maria Menounos with her fiance, Keven Undergaro, and her parents, Litsa and Costas. The Green Monster is going leafy-green — and Greek. Maria Menounos, TV host and host of Sirus XM’s “Conversations with Maria Menounos,” opened her healthy-eating concession stand, Maria’s Greek Kitchen, Monday, and it’s a big step away from the traditional hot dogs and nachos most Red Sox fans and concert-goers typically reach for. Yawkey Way’s newest eatery — located right next to Savenor’s Butcher Market — offers four different Greek foods, all inspired by Menounos’s mother’s recipes: kabob in a cup (chicken or beef), a hummus plate with pita and vegetables, a beef gyro, and Greek salad wraps. “I wanted to make eating healthy simple, not cumbersome,” Menounos, a Medford native, said at a media event for Maria’s Greek Kitchen last week. She explained that the menu options were chosen both for their healthier ingredients, all of which are organic with free-range meats, and their accessibility to guests squeezed into seats at Fenway Park. Menounos picked up one of the Greek salad wraps on display (Romaine lettuce holding a bit of Greek salad) and chomped into it. “You can eat it like a hot dog,” she explained, whereas a traditional salad would be too messy to eat in a stadium seat. It’d be tricky to finagle a kabob stick while balancing a beer in your other hand, too — hence the cup. There’s no cheese on the menu, part of Menounos’s and Fenway’s food and beverage partner, Aramark’s, effort to create options for vegetarians, vegans, and those with allergies and dietary restrictions. There’s one place where you can get a veggie burger at Fenway, according to the Sox website, but as for healthy eating options, that’s about it. Ron Abell, Fenway Park executive chef, said there are actually quite a few people who ask for something besides pizza and pretzels after a game. Abell said that Maria’s Greek Kitchen continues the implementation of healthier eating options that Fenway started in 2015 with the rooftop garden on top of the stadium. Around 7,000 pounds of organic produce is grown in the garden each year and used in dishes at the EMC Club restaurant at Fenway. Now, that produce will go to Greek Kitchen as well, using different vegetables as they’re in season. Menounos said she was glad to use the rooftop garden at her stand. “I saw different vegetables I had never seen before, and my parents grew all their own vegetables growing up, so for me to be surprised by a veggie was a big deal,” she said. 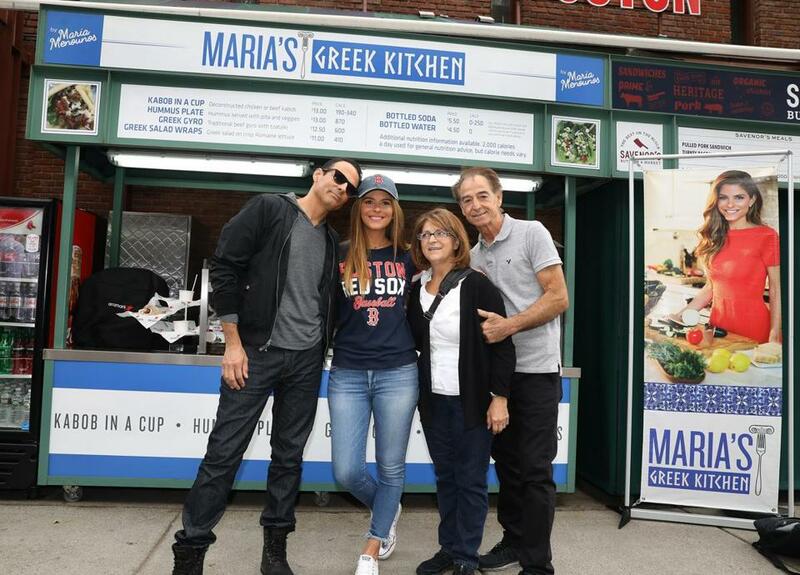 Opening Maria’s Greek Kitchen at Fenway is a big deal for Menounos, who had a non-cancerous brain tumor removed in June. Her mother, Litsa, who was at the event with husband Costas and Menounos’s fiance, Keven Undergaro, is battling stage 4 brain cancer. Menounos used to sell sausages outside the park growing up, and she and her family would clean nightclubs on Lansdowne Street. Now, she’s stopped by a Greek family walking down Yawkey Way, who chat excitedly with her in Greek and pose for a selfie. Kaitlyn Locke can be reached at kaitlyn.locke@globe.com. Follow her on Twitter at@ke_locke.